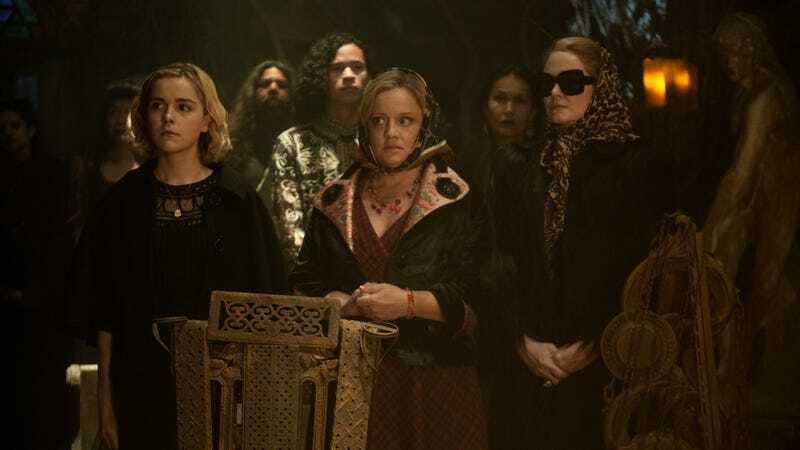 At last, after two episodes of dense world-building, Chilling Adventures of Sabrina has set up some version of what always seemed likely to become the status quo: Sabrina gets to keep one toe in the mortal world while also learning about magic. As Ms. Wardwell is quick to point out, this is a far more efficient way to corrupt her loyalties. Unlike Father Blackwood, who doesn’t have a lot to work with, Wardwell has spent enough time with Sabrina to notice how far she’s willing to go for her friends. "The Trial Of Sabrina Spellman"
So while Sabrina will now be under the watchful eye of Father Blackwood, she’s hardly likely to start trusting him. The case that gets her to the Academy plays out as Sabrina-sized version of the famous Devil vs. Daniel Webster story, which also features a Daniel Webster arguing his way out of an apparently unbeatable contract. For Sabrina, victory hinges on the long-ago actions of Aunt Hilda, whose attendance at a Catholic baptism predates Zelda’s attendance at a dark baptism by one day. Sabrina’s father may have wanted her to join his religion, but her mother seems to have had similar impulses. Sabrina’s reaction to this is a little odd—in her eyes, this is just proof that both of her parents lied to each other. But wasn’t what her mother did an act of rebellion? We don’t know yet whether or not she knew about her husband’s background, but it certainly seems likely. And how is her father a liar in that situation? The problem with never really knowing where our loyalties are supposed to lie is that we never know how bad anyone’s behavior is. There are times when Sabrina seems to have been surprisingly uncurious about her parents’ lives. Shouldn’t records exist about her mortal mother? Also, why is Hilda surprised about getting excommunicated? She helped sneak a witch baby into a Catholic baptism. What did she think would happen? The writing is so inconsistent about Hilda. She seems to have qualms about what her religion does, but not about pushing Sabrina into it. She commits major rebellions from it, but doesn’t seem to have ever really considered leaving her faith. Speaking of things that are surprising, why doesn’t Sabrina question the dream vision she has about Webster? She knows there are forces conspiring to bring her to Satan, and that they’re present in her school, but she doesn’t question the weird dream sequence that brings her directly to a book of old clippings about Webster’s legal career. Of course, the dream has the exact opposite intended effect, because obviously Webster explains what happened to him. Are Wardwell and Dr. Blackwood going to be locked into an endless fight over who is worse at their job? But this is a lesser concern than the possibility that Sabrina isn’t proving to be a very worthy adversary for Satan. She stands up for herself, but the only resources she seems capable of marshaling are suggested to her by other people, whether it’s Ambrose sending her to Webster, or Wardwell…manipulating everything she does. There are plenty of other shows that featured a scrappy outsider battling against an overwhelming evil, as she’s doing here, and what made a show, like, say the Vampire Diaries, successful was not that its heroes overpowered their foes, but rather that they proved clever enough to overcome them. Sabrina presumably can’t defeat her nemesis in one-on-one combat. But she can be at least a little smarter about how she takes him on. Harvey has 1) read The Bluest Eye and 2) thinks it’s a classic. Now we know why she’s dating Harvey. Zelda had a very dignified exit after dropping a chunk of hair on the man she was seducing. This episode, it was Roz’s turn to have a sad thing happen to her. We’re told over and over again that she and Susie are so important to Sabrina that she’s turning down great power to be around them, but neither of them has any characteristics so far beyond liking Sabrina and experiencing suffering. That dude Ambrose hooked up with killed the lizard, right?